It’s time for that long-awaited family vacation. Make this the tropical escape your kids will never tire of talking about. Take three days off to experience the island paradise of Palawan with your family. 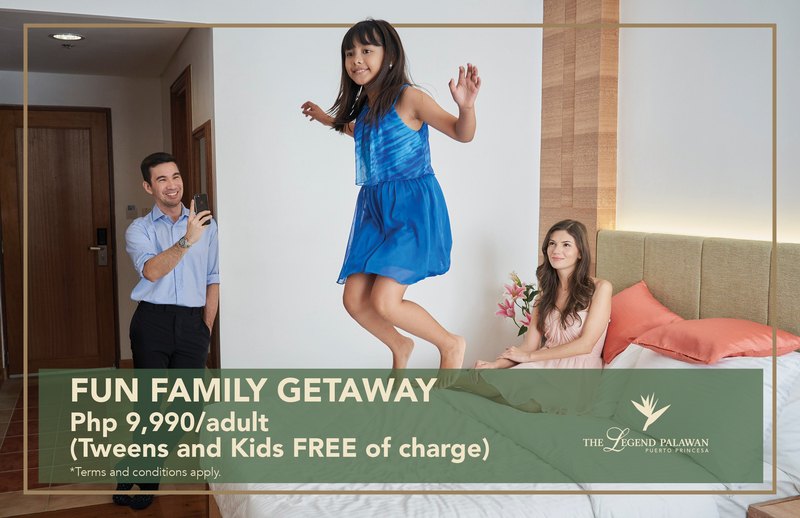 Simply book for two (2) adults at ₱9,990 each and have two (2) kids, ages 17 and below, stay for free! Package comes complete with accommodation in a Deluxe Room, Daily Breakfast, day tour to Honda Bay’s famed Isla Pandan, and much more. – Minimum of two (2) adults and maximum of two (2) children per booking. – Child policy: Tweens and kids ages 17 and below stay for free, inclusive of daily breakfast, 1 lunch or dinner, and Isla Pandan day tour in Honda Bay. – No cancellation is allowed. – Prior reservation is encouraged. Subject to room availability. – Promo rate is not valid of group/corporate bookings. – Promo cannot be used in conjunction with other ongoing promos, privileges and discounts, including Senior Citizen’s discount. – No refund or re-scheduling is allowed for early check-outs. – In case of force majeure, alternative/optional tours will be provided. – Offer is subject to room availability and blackout dates may apply.